I’ll freely admit that I can be a little bit addicted to kitchen gadgets, but my addiction is more under control now that it was.. honest! I know I sound like a broken record, but not having pasta has been one of the more annoying and painful aspects of switching to a low carb diet. The bean based “pasta” is edible, but I’d always quite liked the taste of spiralized vegetables aka courgetti. I’d had several spiralizers over the last couple of years. The tabletop one was a disaster (for me) and the handheld one I’d been using was a pain to use and even more of a pain to clean. The guys at Joseph Joseph have an excellent track record in producing practical kitchen and household gadgets that look great and work. Price-wise they aren’t the cheapest, but you’ll often find their products at reasonable prices if you shop around a little. Their take on the spiralizer is excellent. It looks well, it doesn’t take up a lot of space and using it is very easy. The coarse one works well for doing courgetti. 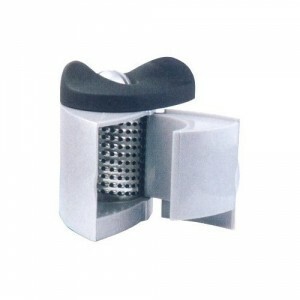 The “fine” blade would probably work best for shredding vegetables for a salad or similar, while the grater is meant to be for doing carrots etc., in tiny bits. I’ll freely admit the only attachment I’ve been using is the “coarse” one, but it works well so I don’t need anything else! Once you’ve spiralized the vegetables, which in my case is most often courgette, it’s just a matter of sautéing them a little before serving with the pasta sauce I’ve made. Overall I’m really happy with it. 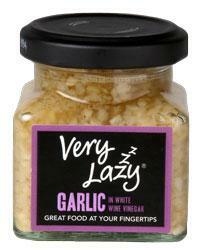 I love garlic. It’s a wonderful food that adds a little something to a lot of different dishes. But sometimes peeling and crushing it can be a pain in the neck. You can use a knife to peel it and crush it, or use the heel of your palm to break it up before peeling it ..
Then there’s garlic crushers, though they’re awkward to wash and if you’re only crushing one or two cloves you’d have to wonder if it was really worth the effort in the first place..
It’s both a garlic peeler and crusher in one. Simply pop a clove in, turn the handle and it does everything else. Just use a teaspoon of paste for every clove you would have spent a couple of minutes preparing.